The different types of impact and how to use them for incredible results. How to incorporate self-defense techniques with weapons such as knife and stick. A scientific progression that not only ingrains techniques correctly but also increases your knowledge and versatility with them. How to avoid the most common mistakes that slow down your progress and can even cause injury. 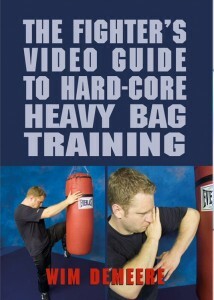 How to hit the bag with devastating power using arms and legs, knees, elbows forearms at all ranges. Practice brutal grappling techniques such as throws, sweeps and takedowns with full power. How to ingrain life-saving but vicious ground fighting techniques you cannot practice with a training partner. Cheap and easy training supplements that take your training to the next level. Loads of grueling drills with or without a partner to reach your maximum potential. Click the image below to buy this unique video now!